The National Junior Tennis & Learning (NJTL) network is a nationwide network of community tennis organizations seeking to develop the character of young people through tennis and education. NJTLs are unique as they offer a variety of on-court programming & educational and life skill components designed to enhance a child’s overall development. to fully develop their tennis skills so they can derive a lifetime of enjoyment from the sport. The 20th Annual USTA Foundation NJTL Essay Contest is now open! Entries for the 2018 NJTL Essay Contest must be submitted to the USTA Foundation by an NJTL on or before 12:00 pm Eastern on Friday, June 29, 2018. NJTL chapters may set local deadlines prior to this date. (No individual entries will be accepted.) The question for the essay is, "What is the most important lesson you have learned thus far through NJTL, and how does that lesson help you in your life as a student, a tennis player, and an individual?" Contact your local NJTL chapter for more information and to enter. The NJTL Essay Contest is a widely acclaimed educational tool. NJTL participants are asked to write essays answering a thought-provoking question requiring research and analysis. Over 2500 entries are received each year and 10 national winners (one boy and one girl from each age group) receive an all-expense paid trip to New York City to participate in Arthur Ashe Kids' Day at the US Open and to accept their awards at the NJTL Essay Awards Luncheon. It's a once-in-a-lifetime experience, and we are always amazed at the thoughtfulness of each and every student. Off the court, he was a social activist taking on issues like racial prejudice, AIDS, apartheid and education. One of his many legacies includes National Junior Tennis and Learning (NJTL), a network of youth-serving organizations that provide tennis and education for all. His wish was for NJTL to be a resource for kids to develop skills for leadership and academic excellence. Visit the Arthur Ashe Learning Center at ArthurAshe.org for resources & information about Arthur Ashe & his legacy. 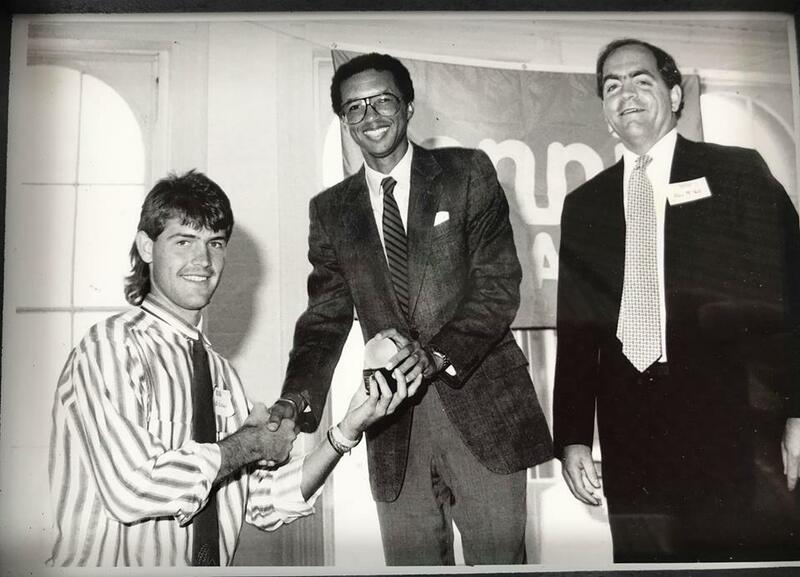 Circa 1988 Tennis Magazine College Player of the Year Award being presented to Keith Evans (present day Director of Tennis, KE Tennis Academy at Germantown Country Club) by the great Arthur Ashe. Photo taken in the World Trade Center restaurant, Windows on the World (Building One, the North Tower of the original World Trade Center complex in Lower Manhattan).